Stump Grinding in Northants, Bucks, Oxfordshire and Warks. We offer a professional tree stump grinding service equipped with the latest machines to tackle any size and number of stumps. From a single tree stump in a garden or for a range of stumps on a large estate that need clearing, you can rely on us and our specialist equipment. 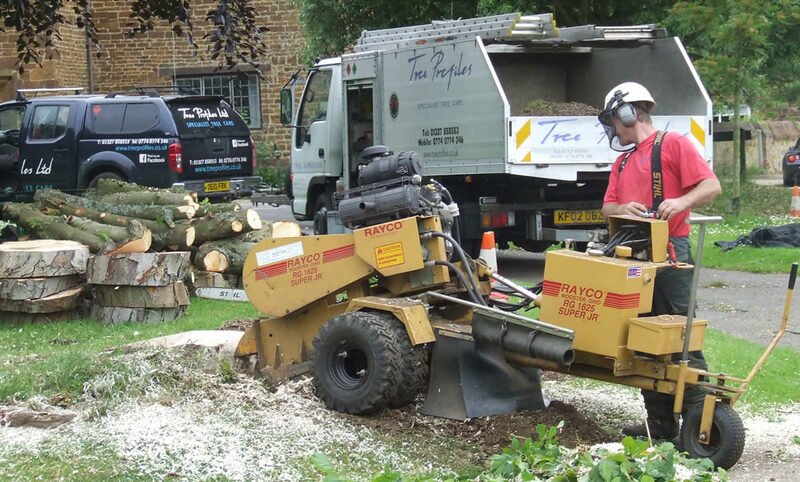 That’s because smaller machines are used when narrow access might otherwise be a problem and our large stump grinders can tackle the width of any big tree stump. Plus when we are done your site will always be left clean and tidy. All the debris will either be removed or the root mulch used as a compost and backfilled into the hole. With a very experienced team, fully qualified and insured, our tree stump grinding and removal services come with a guarantee of satisfaction every time. We cover a wide area for stump grinding including Northamptonshire, Buckinghamshire and Oxfordshire. A member of the Arboricultural Association, we have been approved by Trading Standards and we are also a member of Buy with Confidence.